Jimmie Johnson wins last year's Cup race at Darlington Raceway. NASCAR makes its annual stop at Darlington Raceway, one of the most difficult tracks on the circuit. The 1.366-mile track is known by many names: The Lady in Black and Too Tough to Tame. The Sprint Cup Series and Nationwide Series will take their turns under the lights to see which driver can get on the Lady in Black's good side. 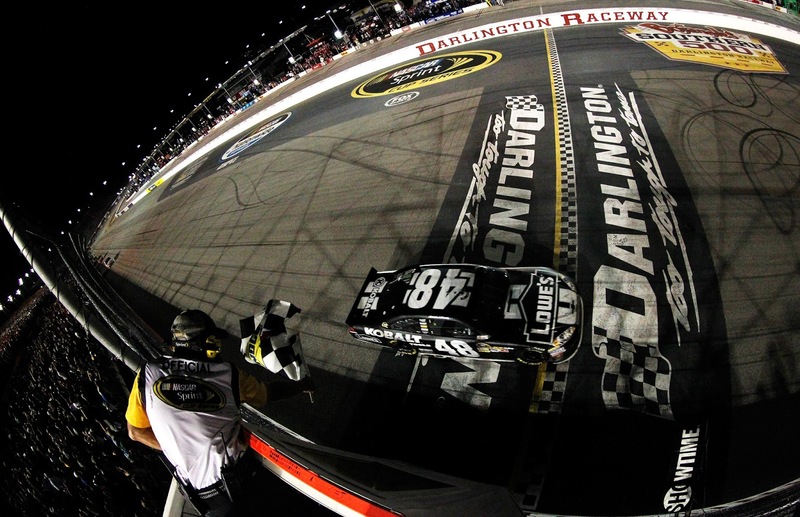 The following is a handy guide to track events and TV coverage this weekend at Darlington. Times are in Eastern Standard Time. Events without a channel listed will not be televised. 7:30 p.m. NNS: VFW Sports Clips Help a Hero 200, ESPN2. Green flag: 7:45 p.m.
6:45 p.m. NSCS: Bojangle's Southern 500, FOX. Green flag: 7 p.m.